Posted August 2nd, 2011 by David Porter & filed under Technology. Back in 1964, a book was published that showed its author possessed remarkable insight into the forthcoming information age. He was Marshall McLuhan, a middle-aged English literary professor from Toronto, and his book was called Understanding Media: The Extensions of Man. However, it was a phrase from it that established him as the godfather of modern media studies. ‘The medium is the message’. It meant: the form of the medium embeds itself in the message. If people are watching TV, that medium becomes the main influence on how they take in the message. Television as a being takes on a life of its own. The same is true of the internet or any other of the myriad forms of communication available to us nowadays. McLuhan argued that the medium rather than the message should be studied, and so it is now. Douglas Coupland argued in The Guardian (20 July 2011), that the ‘psychic fallout’ in people’s inner lives from the new media will damage souls. He felt that to people who remembered when technological change was breathtaking and jaw-dropping, TV was the instrument of greatest change in society. Since 2000, it has been the internet, with all its spawn: Google, Facebook, YouTube, smart-phones, apps, texting, entertaining, games, gambling… he even included reality TV too. Coupland’s main point was that all these things ‘jackhammer’ into people’s lives and time once reserved for newspapers, daydreaming and (way back then) television. He pointed out that people expect endless streams of new media technology in a ‘universe of constant media change and mutation’, and all this was warned by McLuhan fifty years ago. 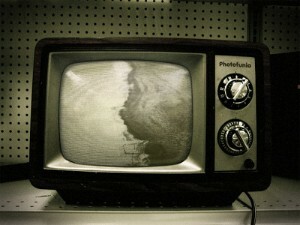 He lamented that once TV was seen as dangerous, stopping families communicating with each other. Now, watching TV together is seen as a quaint old nostalgic thing. McLuhan observed that the medium changed people by forcing them to favour certain parts of the brain over others. An hour on Facebook, for example, is an hour not spent using the brain on something else (watching TV?). As television integrates with other media, some people may be able to multi-task all things at once, except perhaps think, reflect and consider for long. In the meantime, while a quote from 1964 can be dismissed as old and irrelevant, it might be worth considering that a timeless wisdom came from ancient India. They believed that human beings are a combination of three component elements: air & space; earth & water and energy & water. When the elements are in balance, a person is healthy. In other words, we are what we eat. And that is the reality of the brave new world of instant media immersion we find ourselves in during these times. We can only wonder what our great grandchildren will make of it all!